Crossing borders and oceans, we can see multisport as that one thing that brings us together similar to the Olympic ideal. No matter what nation, race or religion, the boundaries are erased and we all come together in the name of sport. With it are the egos and chest thumping, all part of the human act we know as one-upping or victory. Somewhere tied into it all, behind the winner, are the real athletes who compete for health, lifestyle and pure love of life. Athletes like Stefan from Sweden--who, despite getting little sleep and/or training this year, finished Ironman Kalmar in Sweden with a purpose bigger than the big Swede himself--and to top it off, all with a smile bigger than the space between his shoulders. Talking with Stefan, one can't help but be affected by his good nature and can do attitude. This seems to be a common thread in the athletes I work with, excelling. I had some athletes excel beyond their dreams, and some have faltered along the way and had some not so great results. We can't all get better each year, or beat last year's results 100% of the time. We expect to improve some, or a lot, but reality is that sometimes life gets in the way, or injuries occur. Improving is a science but not a perfect one. 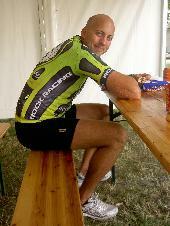 Tim DeBoom 2x Ironman World Champion does not improve every year. Peter Reid didn't improve every year. Even the great Lance Armstrong had a year where Jan Ulrich nearly nipped him at the end of the Tour. Certainly I have not improved every year either, however there is hope to put a year behind us and make it "next time" around. Next time...that is hope. We have it in all of us, at least the successful ones do. Obstacles are only those things that appear when you take your eyes off the goal--that is something I read on one of those inspirational posters you see in the magazines of the back seat pocket of an airline. It rings true, I've said it many times. Here is a photo of Stefan after an Ironman Kalmar (not a WTC event--so maybe the name should be technically "iron distance" Kalmar to hold off the lawyers of WTC from their race organization). He is smiling, and while he is chowing down on what looks to be a hot dog and chips, he has the smile that makes you want to just get out there and race just for the fun of it. It's what makes triathlon such a great sport to compete in--seeing the happiness and accomplishments through right to the finish line. We share the common goal of start to finish, we all do it in all nations and religions in multisport--there are no boundaries triathlon cannot cross in putting a smile on someone's face. 8/6/2008: This is the first posting of what I hope to not be a blog. but the trend for me seems to be posting rather than blogging like so many triathletes out there do. Blogging can get you into trouble if you open your mouth too much and are too opinionated, so I hope I can post instead and keep it along those lines of neutrality. Sure there will be opinions along the way, but I'll try to keep them middle of the road and without profanity which so many blogs do have in them. Who knows, maybe it will or won't work. Either way, it is worth a shot. There is a fine line between a post and blog, but there is a difference, and both seem to be diary-like at a glance. 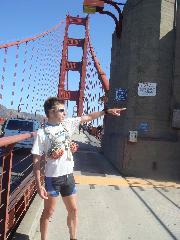 I just got back from a wedding at Fort Wiley in San Fran, and stayed with an ultra runner friend from Hawaii. Paul took me on one of his common routes when he lived in San Fran. It ended up being about 4 hours worth of running, picture taking, and of course, shopping at the Sports Basement (which I had no idea was such a large store by its meager website). Total mileage was 20.5 miles per the Garmin. This was about 5 to 10 miles MORE than my average weekly running total the past few months, as I've been dealing with some major hip/hamstring issues brought on by the recent discovery of my 6th (L6) vertabrae. Something finally "broke" after all these years & it has hampered my training the last 2 years--sending my training and results into a downward spiral that isn't slowing. Much of it was on trails, as it led us through the Letterman Digital Campus built by George Lucas. I missed seeing the big Yoda statue, but that's fine, I snagged some pics of the cemetery/pet cemetery at Fort Presidio, the Golden Gate Bridge (which was crazy to run across because of all the people/bikers), and of course, a lot of hills/trails & great views of Alcatraz aka "The Rock". To the right is a pic of me pointing towards The Rock, then below that is the cemetery at Fort Presidio, followed by my friend Paul running up a very steep section that was about a mile long (we were doing about 13 minute miles uphill it was so steep). But we kept it all aerobic at that pace, so it wasn't too difficult. Here are the details on the run. Started at Union and Van Ness heading west to the Presidio. 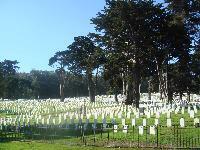 Ran through the Presidio past the cemetaries and to the GG Bridge. Across the bridge, under and up to the Coastal Trail. Crossover to the SCA Trail and down Rodeo Valley Trail back to Coastal Trail connecting to Conzelman Road above the Black Sands Beach. 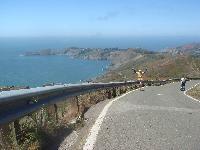 Then we climbed up Hawk Hill before returning to GG Bridge. Across GG Bridge, we headed West through the park along the coastal trail through the old batteries before dropping back down to Lincoln Blvd and to Sports Basement. From SB, we took Marina Greens back to Fort Mason and Aquatic Park, then back up Van Ness to our casa. 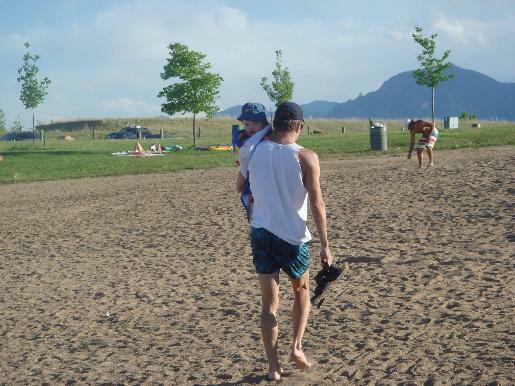 Stay tuned for fun triathlon and lifestyle postings (not a blog), from the adventures of Coach KK!